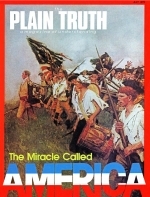 By the time this issue of The Plain Truth has reached many or you, the United States will have officially celebrated its 200th year of independence. Conditions in the world do not permit Mr. Herbert Armstrong and me, however, to spend July 4 at home. We shall instead be in Jerusalem on that day, assisting in the dedication or the Liberty Bell Park in the heart of Jerusalem, where we will be creating a playground for children. We arrived last night in Johannesburg after completing a three day visit in the crucial Middle East oil area of Oman and Kuwait. We shall be in this strategic area for some four weeks and shall also be visiting the neighboring states of Rhodesia and Tanzania.